Pumpkin cookie recipe free of the most common food allergens, that makes this a delicious and safe fall dessert recipe! I always love finding ways to make new cookie recipes, it has to be one of my absolute favorite desserts! However most cookies contain one if not more of the 8 most common food allergies. In this recipe we avoid wheat, egg, dairy and gluten! This cookie recipe is a tasty treat for fall or just anytime of the year, best of all it is super simple allergy safe recipe that is easy to make, which is a good thing since you might just end up making a second batch!!! Pumpkin is a squash that is packed with tons of nutrients! This squash is a good source of potassium, magnesium, carbohydrates, fiber, vitamin A, vitamin C, vitamin K, calcium, and iron. pancake recipe, muffin recipe, pie pudding, cookies, roasted seeds, smoothie recipe, gnocchi! What's your favorite cookie recipe of recipe with this squash by sharing on our Facebook page!! In a bowl combine all dry ingredients (flour, baking powder, salt, and spices), thoroughly mix. In a second bowl add butter and microwave for approximately 30-40 seconds until lightly melted and soft (but not liquid). Next add in vanilla, pumpkin, sugar and mix. Slowly fold the dry flour mixture into the wet ingredients, stirring until all lumps are dissolved. Mix in chocolate chips and stir. Roll dough into tablespoon sized balls and place onto a parchment paper lined or greased cookie sheet, approximately 18-20 cookies. Place cookie dough into oven and bake for 10-12 minutes. The cookies are soft however I did like how they turned out closer to 10 minutes. Note: If you can resist and you don't eat all the cookies that same day, place cookies into a plastic zip lock bag to keep fresh. Plan ahead, this cookie dough can also be made the night before, left in refrigerator and baked the following day. 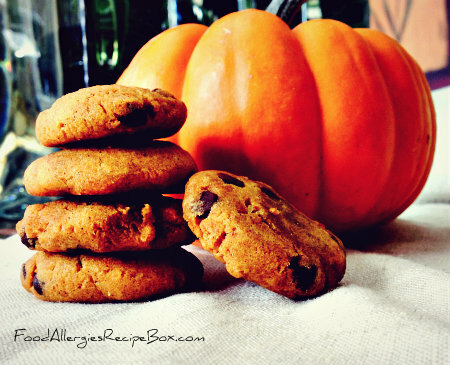 return from pumpkin cookie recipe to food allergies home page!